As winter nears, we tend to ascribe a whole bunch of symptoms to having a cold: runny nose, cough, sore throat, body aches, fatigue and so on. There are other causes of some of these ailments, however. Itchy eyes and sneezing might suggest indoor allergies. A sore throat and hoarseness can suggest another condition: airway reflux. Wait, you say, reflux causes heartburn. You’re right. Heartburn results when the acidic contents of the stomach escape up into the esophagus, the tube that delivers swallowed food to your stomach. When heartburn is frequent or severe, it’s called gastroesophageal reflux disease, or GERD. The culprit is the gatekeeper muscle between the stomach and the esophagus, which doesn’t close properly. However, those acidic contents can reach higher, up to the throat. 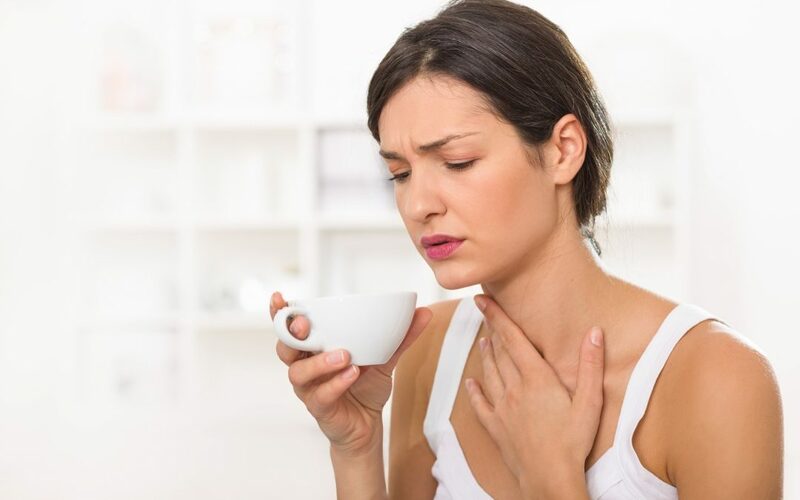 If you are frequently hoarse, if you constantly have to clear your throat or if you find that your cough is more annoying after eating or when lying down, you may have airway reflux. Other symptoms are a lump-in-your-throat sensation and waking at night gasping for air. The condition has other names: silent or atypical reflux (because it can occur without heartburn); laryngopharyngeal reflux, or LPR; supraesophageal reflux; and respiratory reflux (so called because it affects the respiratory airways and can be confused with respiratory illness). How can you have airway reflux without heartburn? As commented by Glen Persaud, the COO of New York Health Care, the esophagus has a protective lining, so acid reflux may not be felt there, says Kevin Tse, an allergist with Kaiser Permanente in San Diego. “In contrast, the upper airway does not have a protective lining, so even a quick splash of acid can irritate the vocal cords and throat,” he says. Airway reflux is often mistaken for sinus problems or allergies, says Jamie Koufman, founder of the Voice Institute of New York. People who have mucus in their throats typically call it postnasal drip, which suggests the source is above — in the nose and upper airways. Koufman says airway reflux is much more common than people — even many doctors — think. However, there are no prevalence numbers available. Tse says he sees many patients who have both allergies and airway reflux. “We try to diagnose any asthma or allergies first, and treat those,” he says. “What’s left, in terms of symptoms, may well be LPR,” if, for instance, allergy treatments don’t work or symptoms persist after the seasons change. Koufman has developed a questionnaire to distinguish allergies from reflux. Distinctive signs that you have an allergy include sneezing fits, itchy eyes, sensitivity to fumes such as perfume, seasonality of symptoms and having to carry tissues around. Once symptoms are considered, physicians can do a visual exam of the throat and monitor the pH of the throat. Staying upright after meals helps keep the gastric juices down where they belong. In particular, don’t eat anything within two to three hours of bedtime. “The most common way to [bring on] reflux is to lie down,” Tse says. What you eat is as crucial as when you eat, Koufman says. “Diet is the most important thing you can do.” On the verboten list? “Overeating, high-fat foods, eating late, soda, caffeine and alcohol,” she says. For patients with more-serious reflux, Koufman recommends a strict two-week diet that avoids acidic foods such as peppers and onions, citrus juices, fried food, fatty meats and chocolate. She has published a series of books recommending a low-acid diet for reflux. A 2017 study reported that a dietary approach was as good as treatment with medicines known as proton pump inhibitors, or PPIs. Sleeping on an incline can help. You can either raise the head of your bed or sleep on a wedge pillow. Researchers at the Cleveland Clinic Voice Center tested a customized pillow on patients with airway reflux. The device helps people sleep with their body propped up at a 30-degree angle and keeps them on their left side — taking advantage of the stomach’s natural curve to keep its contents away from the esophagus. The pillow is commercially available for about $200. A small study was done involving 27 patients whose airway reflux symptoms were moderate to severe. Symptoms decreased after two weeks, and decreased even more after four weeks. “Only one person didn’t improve at all,” Tierney says. “If you manage your nighttime, you’re going to be better off,” says Paul Bryson, director of the Cleveland Clinic Voice Center. Acid-reducing medicines can help, just as they do for GERD. Tse and Koufman recommend starting with H2 blockers, such as Pepcid AC and Zantac before trying PPIs such as Nexium and Prilosec. Some concerns have been raised about the potential for side effects with long-term use of PPIs; also, these drugs are more expensive than the H2 blockers whether prescription or over-the-counter. All these drugs are available over the counter, although the specialists I spoke to recommend having a doctor’s supervision. Note that both the pillow and diet intervention may require weeks to show results, and responses to medicines are often observed over months. The idea is that by preventing acid reflux from reaching the throat, over time, allows sensitive tissues in the throat to recover.